Brett Howden got off to a hot start this year, with four goals and nine assists through the first two months of the season. It was such a good start that many folks began forgetting about Filip Chytil and Lias Andersson, and looking to Howden to be the future top-six center. But since December 1, Howden has recorded just two assists. That’s 21 games with no goals and just two points (it actually extends two games into November, making it two assists in 23 games, but December 1 was a nice arbitrary cutoff date). Suffice it to say, Howden is struggling. Beyond the stat sheet, Howden has been absolutely atrocious in regards to possession and other metrics. Let’s look at some of Howden’s stats, compared to the rest of the forwards for the Blueshirts with at least 100 minutes played this season (16 total). Howden, over the course of the season, is averaging out to be one of the worse possession forwards on the club, both in raw totals and comparatively to his teammates. Since he isn’t scoring, it isn’t something that can (or should) be ignored. It looks like David Quinn has caught on too, as Howden’s ice time has take a huge hit the last three games (6:32, 9:28, 6:18). He’s been playing on the fourth line, anchored by scoring aficionado Cody McLeod. Howden has certainly earned his fourth line ice time (we covered the Pavel Buchnevich ice time piece already, so let’s not re-hash that here). However there is only so much a player can improve when playing with someone like McLeod, who offers nothing in the offensive zone. Howden will need on-ice guidance to grow, and McLeod is not the player to provide that type of mentoring for Howden’s skill set. Given Howden’s struggles and recent ice time, it makes you wonder if Howden might be best served playing top minutes in Hartford to work through his struggles. It’s not like things can get any worse for Howden, and perhaps finding some chemistry with Lias Andersson will help in the long run. What we do know is that playing Howden an average of seven minutes a night isn’t going to do him any good. The kid needs playing time, and needs to work on his game. If the end-state goal is the development of the prospects in an environment that doesn’t stunt their growth, then the AHL might be the best bet for Howden. My bet is that it wouldn’t even be a long stint. There’s no harm in letting him gain confidence in February with Hartford, then come back after the deadline. 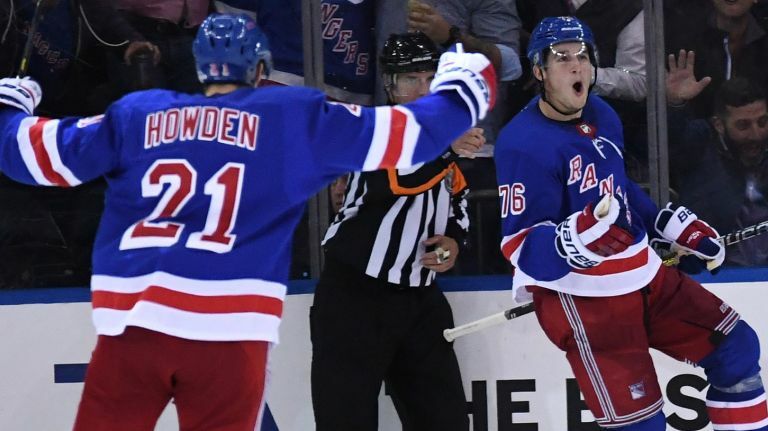 "Is it time to send Brett Howden down? ", 4 out of 5 based on 10 ratings. While Howden has disappeared, I am not sure sending him down is the correct answer. I would rather see him anchoring a 4th line with Fast and Buch, providing him with support. I have also not heard how Lias has progressed since being sent down. Maybe our junior club just has a coach and not a training/development leader. If you had a coach willing to truly roll 4 lines, yeah … but we don’t, just ask Lias. Who? oh yeah, that guy. I would be sending every waiver exempt player down between Sunday and the end of the all star break, just for the cap credits. After that? Who knows. I’m sure some of it is hitting the wall playing a pro schedule is some of it and a reduced training schedule will help freshen him up. That would be SMART and would certainly benefit a player like Howden, not to mention it might help the Wolf Pack make the playoffs as they have 4 games scheduled from the 20th to the 26th (we play on the 19th and then the 28th). unless we are bringing up another youngster, why bother, we are probable trading forwards soon, wait to see what’s what..
maybe package him, maybe package a few players, lol. Jesse Puljujarvi can be available for the right price. Edmonton wants a top 4 dman… Find a way to make that trade work for NYR. Over pay if necessary. Shattenkirk and McQuaid and all the picks from 3rd-7th rounds. How ever it needs to get done, just try, and let us know you at least tried. No…he isn’t scoring with 6 minutes a night. He was clicking with Strome and Vesey….To be honest I am beginning to really despise David Quinn…not bad as AV…I thought this guy was supposed to be good with kids and developing?? Yeah I don’t like him and if he gets fired…nothing to cry about. I think he started holding on to his stick too tight as the minutes went down. Made some mistakes ( only way to learn is make em ). He needs some confidence back for sure. Does he get that staying up ? Or going down with more playing time? The metrics…rolling eyes. The Rangers came out flat last night against the Hawks and were lucky they werent down 3 goals by the time they woke up. The poor metric 4th line Howden, McCloud, Buc was the only line that had any spark and had possesion time in the Hawks zone. They got the cycle game going and McCloud dished out some punishing hits on the Hawk players. Ironically when Quinn benched the 4th line in the 3rd, the Rangers lost momentum and the Hawks pushed back. Hockey is very much a team sport and role players are often taken for granted. The trend that is showing is Quinn definitely doesn’t deal well with young euro players. Andersson, chytil, and buch. Why can’t he get more out of them? Communication issues? Buch has the same point total as Howden with less games , what gives? Longer leash if your from the states? good point. The Russian Whipping Boy and ADA is the Trump Supporter Whipping Boy with Pride Nite at the Garden ADA is loathed by the Garden Leftist PC Ownership.